What happens when brewers take their passion for beer thoughtfully??? They innovate and open a brewpub right in the heart of the city - BKC. The tale dates back to a time when founders of Gateway Brewing Company - Navin Mittal, Rahul Mehra & Krishna Naik decided to create a niche to brew classic styles beer with local ingredients at an affordable price and carved a new definition 'A lot can happen over a beer". 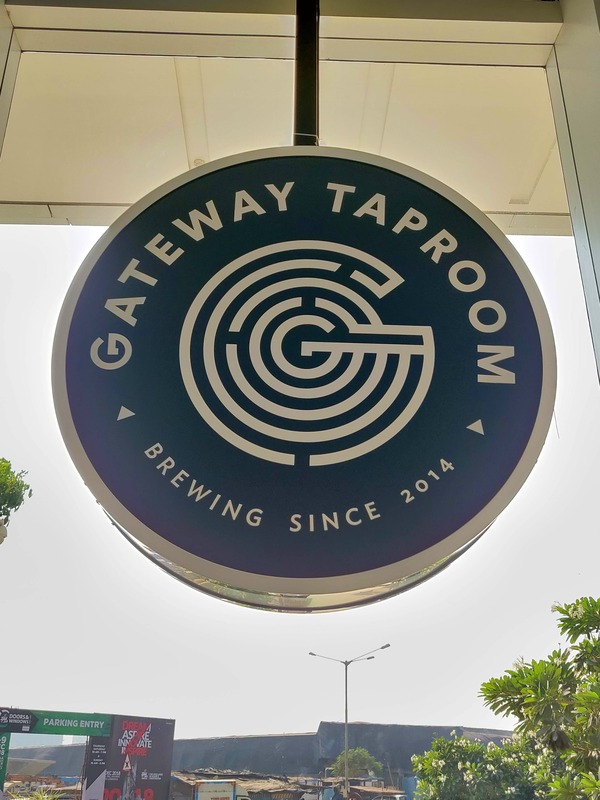 Behind the cold glass walls and amidst the corporate hullabaloo nidus Gateway Taproom which derived its name from Gateway of India shaped with hopes and inspiration. A microbrewery that serves flagship beers and experimental / release beers besides classic beers. Space echoes a European themed watering hole extended to exclusive gastronomic delights. The sunkissed decor looks rustic with brown wood high tables, bistro-style benches and white brick walls partnered with swing wall lamps. White Zen meditating alongside like a saint is a sight unmissable. White & yellow gingham tablecloth is a great enhancing covering. Gateway Taproom can easily accommodate between 80-100 guests at a time and an ultimate party place for bachelors or bachelorette get-togethers or corporate parties. Fall head over heels with the place and don't miss the chance because there is glamour, pleasure and enjoyment. Chef Viraf Patel of Cafe Zoe is the consulting chef who has curated the menu with a slight of Italian, Continental and Indian cuisines making Gateway Taproom a dining place too. Start with what they are known for beers. You can choose 300ml, 500ml & 1000ml stein singles or flight or pitcher. White Zen, Doppelganger is classic starters with Royal Stout, Belgian Witbier, Berlin Sour to pace up the drinks. For abstainers, the mocktails are apt with refreshing beverages like Summer Cosmopolitan made with apple, strawberry & cranberry followed with another flavourous drink Black Currant & Grape infused with lime & cranberry. Cracker Bits are ready to eat bar nibbles with chillis and spices and a great accompaniment to your drinks. Basil Hummus with Melba Toast is a healthy and light appetizer with pine nuts, basil leaves, olive oil & fresh lemon juice. If you are avoiding fried snacks, then try Baked Parmesan Puffs with cheese & spiced bell pepper sauce. Enjoy Arancini - another easy to digest starter made up of lightly crumbed risotto & cheese balls. Prawns and Calamari Ajillo is a general recommendation by the staff prepared in citrus butter sauce. The staff insisted for Roasted Bhavnagri Chilli stuffed with ricotta & over preserved yellow cheddar. If you are still on for some main course then enjoy Chicken Schnitzel with skinless and boneless chicken breasts coated with flour, beaten eggs and breadcrumbs deep fried and served with potato salad. Don't miss the Grilled Prawns with veggies & mash potatoes for a wholesome seafood experience. To relief your taste buds, desserts are a must and a ritual. The three-layered Tres Leche Milk Cake is soft with an awesome texture. Even their Financier is worth drooling over with warm almond cake and ice-cream. Gateway Taproom has become a lunching favourite amongst diners giving a final touch to their overall experience. Whatmore, call it a pub or a restaurant they fit the bill very well and an ideal destination if you want your happiness to reach a climax. So wait no more, head with your squad and remember "fun is where your loved ones are".